Recreating the safe, sheltered feeling of the womb, swaddling calms and comforts babies, allowing them to sleep peacefully. Swaddling with Imagine Baby muslin-weaved bamboo makes the experience that much more luxurious! With the very softest fabric touching baby, and a light stretch to the loose weave your little one with feel secure without feeling restricted. The light weave also helps keep baby from overheating. 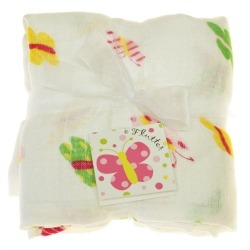 Imagine Baby products Bamboo Swaddling Blankets are made with 100% Rayon from Bamboo Fibers and come in prints that match their adorable cloth diaper line up. Baby Leggings are cute, practical and affordable! Bought one of these before my daughter was born and its now her favorite blanket. Will be adding a couple more as back ups in the new future. This swaddle blanket is so cute and very soft. its nice and big too! This is hands down the softest baby blanket/swaddle ever. We own a few different brands but we always seem to gravitate toward this one. My son isn't a huge blanket snuggler, but he loves this one. 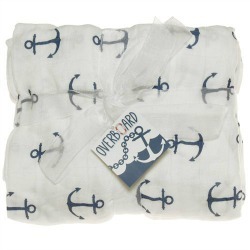 We have the anchor print and it's so cute! I also just purchased one for a baby shower gift. These are great for my three year old who sleeps hot. They're warm enough to keep the chill off but are thin enough she doesn't kick them off during the night. They're a great size for cribs and toddler beds. They're silky soft and hold up great over time. We've had ours for a long time and they just get softer with every wash. The prints are adorable but do a fade a bit after a lot of washes. I have this in the barnyard print. It is so cute and it is the softest swaddle blanket we own. Much softer than the aden + anais. We love it and want more! It's so cool and breathable.